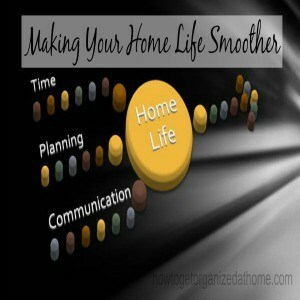 Making your home life smoother is more than just planning and coordinating better, though this helps to get over some difficult busy periods in our schedules. How you interact with each other is just as important too. If you talk to your family with the respect they all deserve they will pass this back to you, hopefully. Helping out when other family members are finding their schedule difficult will allow them the ability to help you out if the need arises, but you shouldn’t expect the favour returned. Sometimes it is just not possible to help, and understanding and respecting your family will help allow less stress in your home life. There are times where things become more difficult than at other times; it is just part of life, some things work well and at other times it is more difficult to manage. Dealing with these ups and downs within your family is important, they might need extra support and help and not being afraid to provide that encouragement is important in allowing a smoother ride, when it comes to the emotions attached to family life. Making a family work is about the give and the take, which you sacrifice to ensure that while you want the perfect outcome, this isn’t always possible. Being able to manage the rougher moments is important, if it does become too much for a family member, it is important that they seek help to get them through the more difficult periods of their life. It is important for you to realise that while it would be perfect for everyone to manage and to achieve everything they want, it is possible that this doesn’t go to plan, and by learning to prioritize your daily tasks it’s easy to recognise those items that you can let slip to another day. For me I would love to get up early to start work before the household is awake; however, I know that this will never happen unless a miracle struck! I am not a morning person, I prefer to whittle away the time in the early hours of the morning catching up on the last-minute things. This is the perfect time for me; it is when the house is quiet. Finding the right time for you is important, it is also not impossible to change; it will take time and commitment from you though. Don’t multi task, it just doesn’t work, you can end up with multiple projects all in various stages of completion and this can make you feel more frustrated. I know I am guilty of this all the time. I get side tracked very easily and then get annoyed with myself that I haven’t focused fully on the task in hand. Learning the art of saying no, this I am not good at and often take on more than I can comfortably manage and it makes my life difficult. If only I was more capable of saying no, it would make my life so much easier and a lot less stressful. Planning is the key to making your home life as smooth as possible, it will allow you to see when you have clashes before they become a problem and they are easier to resolve when you have the time to do so. Making your family’s time to run together instead of competing for that same time slot. Therefore, if you are looking to make your home life smoother, then you need to consider where the problems lie. Is it time management and lack of planning that is causing the issue or a lack of communication between the different family members? Being able to communicate effectively between different people is an important skill, which you will need in life and one where you can help other members of your family to achieve. Knowing where you need to work to make your home life smoother, will allow you to apply the appropriate measures for you and your family. Thank you … it is an ongoing thing to evaluate and keep things running smoothly…. especially when flexibility is needed with a husband’s schedule. 🙂 Good post. Very thoughtful post. I’m like you: I know mornings could be super productive, but I can’t do it. All my life, I’ve wanted to be a morning person, but I can’t make it happen. I also wish I was a morning person. (I actually used to be one years ago until I married a night owl and he converted me! LOL) I’ve found that what helps me the most is laying out everything we need for the morning the night before. Outfits are picked out, lunches are packed, and bookbags are prepped and waiting by the door. It’s eliminated so much stress from our daily routine!